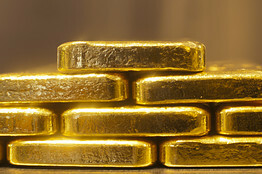 - Bullish speculators increased their gold bets by the largest amount on record. - Speculators betting on a gold drop also made large increased to their own positions. - Next week's major event is the FOMC meeting and conference and we expect that Janet Yellen will offer investors nothing unexpected. - Asian gold demand has been subdued with a large rise in May Indian imports that we expect will fall in June as jewelers de-stock. - With expectations of a lackluster Fed meeting, we see no reason to change our short-term position and we expect gold and silver to follow current momentum downwards next week. The latest Commitment of Traders (COT) report showed a week of speculators jumping into gold on both the long and the short side. On the long side, we saw a massive gross increase in speculative longs as traders added more than 50,000 contracts on the COT week - the largest increase in our records going back to 2006! 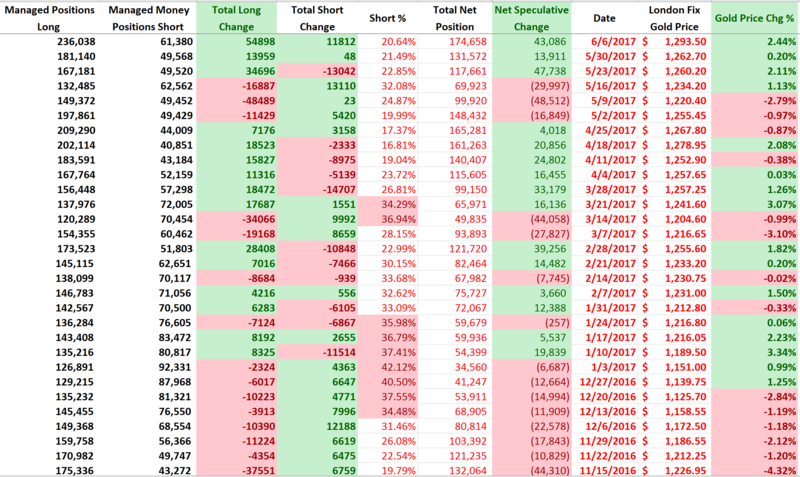 Shorts were not sleeping either, as they increased their own positions for the week by more than 10,000 contracts. After a strong start to the week and a rise close to $1300, gold ended the week on a three-day losing streak and down around 1% on the week - which matched our call for last week. Silver followed gold down for the week with a drop a little under 2%. Looking forward to next week, the biggest economic event will be the FOMC meeting and rate decision. With the vast majority of market participants expecting a quarter-point rate increase, the key for PM investors will be what Yellen says during the press conference after the meeting and how it reflects in the Fed's path forward. There are many ways to read the COT report, and there are many analysts that focus specifically on this report (we are not one of them) so we won't claim to be the exports on it. For a third week in a row, speculative longs increased their gold positions - and this week it was by a huge amount. 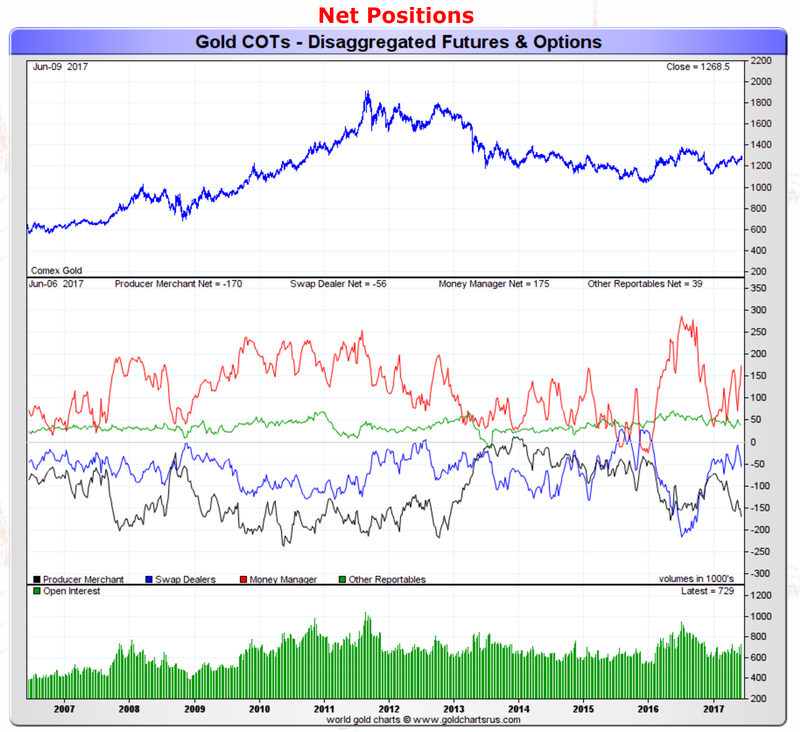 For the week, gold speculators increased their positions by 54,898 contracts, which was the biggest gross increase in speculative longs in the COT dataset dating back to 2006. 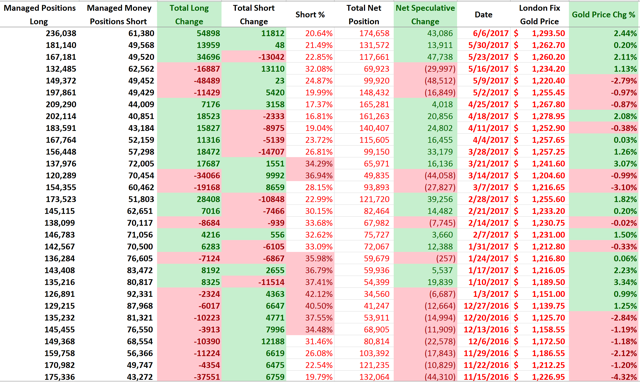 Shorts were not sleeping this week either as they also increased their positions on the week by a chunk 1,812 contracts. While this is a smaller number, it was large based on historic short weekly norms. The red line represents the net speculative gold positions of money managers (the biggest category of speculative trader), and as investors can see, we saw the net position of speculative traders increase by around 43,000 contracts to 175,000 net speculative long contracts. 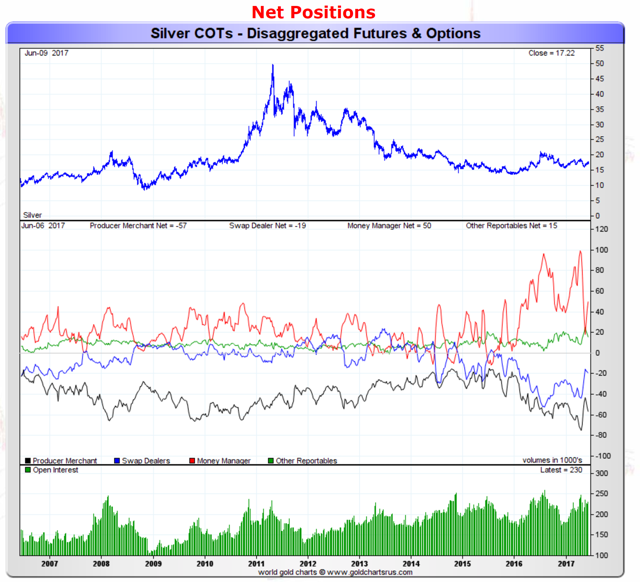 The net speculative long position is now at levels that are on the high side of historical averages, but we do note that this COT report was based on Tuesday gold price of $1293 - it fell later in the week significantly so some of the positional data should be adjusted lower. The red line which represents the net speculative positions of money managers, showed an increase in the net-long silver speculator position as their total net position rose by around 7,000 contracts to a net speculative long position of 50,000 contracts. After reaching a low a few weeks back (the perfect time to buy silver) we are now at average or a little higher than average levels in silver too. Obviously, the big upcoming event will be Wednesday's upcoming FOMC meeting rate decision and post-meeting conference. Markets are already pricing in a .25% rate increase at the meeting, which we think the Fed will certainly do as they HATE to surprise markets, but the key thing for investors to look for will be their stance on rates moving forward - will it be hawkish or dovish? Based on the economic data over the second quarter, the economy still seems relatively sluggish, with official inflation data very subdued. In fact, the only real bullish thing that we see concerning the economy is the stock market - and of course that is driven by expectations and not hard data. If it weren't for the rising market we feel the Fed would be much more cautious with rates. Ideally, the Fed would want to see stronger economic data and a flat market as it allows stock valuations to catch up to economic conditions. The Fed has quite a dilemma here as if they are too dovish the stock market rises, while if they are too hawkish they see a drop in stocks while economic conditions are weak - which will only exacerbate the situation. Thus, what we see happening is going to be a statement without conviction and a Yellen press conference that is vague and emphasizes the Fed is "data dependent" - which to us means they really have no plan. As it concerns precious metals, we expect some caution entering the Fed meeting as long positions are a bit higher than average which would be expressed in a potential early week drop in metals. But since we are expecting a vague, lukewarm statement then a post-meeting reversal/recovery might be in the cards as traders realize there is nothing new with the Fed. Last week we changed our short-term views on gold and silver to Neutral-Bearish as we expected a bit of a pull-back as weak Asian demand would outweigh positive investor sentiment. While preparation leading up to the Fed meeting may lead to volatility, we think after another "no-direction" Fed meeting that volatility will calm down as markets start looking to the next catalyst. Having said that, we are not seeing strong Asian demand (signified through higher premiums) and we feel that Indian demand may be lackluster for the next month as jewelers had already imported significant amounts of gold in preparation for a higher tax rate. For now we expect gold and silver prices to meander with more downside risk than upside potential at this price level - thus we are maintaining our Neutral-Bearish stance. 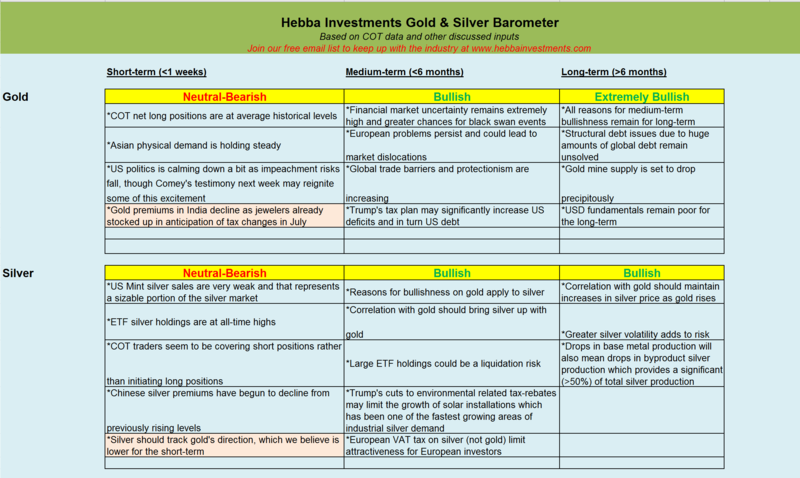 As we said last week, we think it's wise to some profits off the table as we are concerned about the weakness in physical demand from Asia, while ETF holdings remain at or near all-time highs in gold and silver. 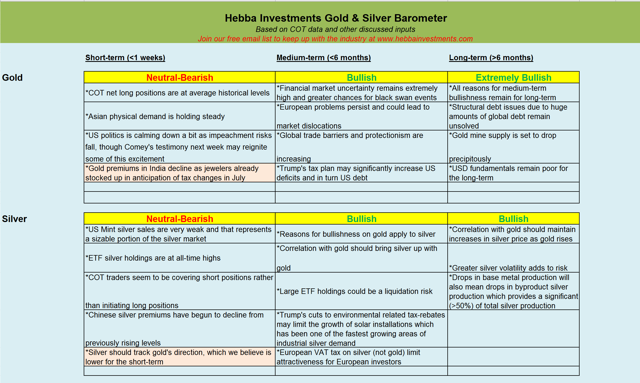 It seems prudent to start taking profits on gold and silver positions (SPDR Gold Trust ETF (NYSEARCA:GLD), iShares Silver Trust (NYSEARCA:SLV), Sprott Physical Silver Trust (NYSEARCA:PSLV), and ETFS Physical Swiss Gold Trust ETF, etc). While profit-taking applies to short-term traders, we think longer term traders have no reason to be alarmed and we expect to see much higher gold and silver prices in the future.